I came across this brief article by Les online a few years ago and have found it very helpful in narrowing down the dates for the Barling pipes that come across in my ongoing hunt for estate pipes. I wrote to Les through EBay and asked his permission to reprint the article here on rebornpipes. He graciously replied as noted below. Thank you, Les. … if you get a comment by collector Tad Gage, his judgment is better than mine since I learned much of what I know from him as well as others. 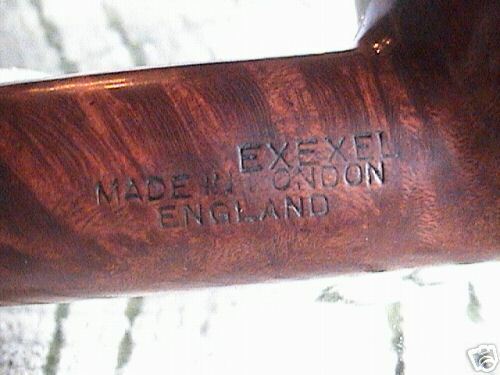 Most of this info I deduced over time by close observation of the nomenclature I found on my own pipes but also from pics I saw on ebay pieces that were listed for sale… Note – Barling nomenclature has never been an exact science and this info should be considered as a guideline rather than a mandate. Even the book done by the late John Loring about Dunhill nomenclature is not perfect since exceptions have been found in those pipes as well. The following is a visual reference guide that allows the reader to identify the various eras of Barling nomenclature. Please note that some exceptions will occur since not every pipe had stampings that are completely in conformation to the norm. Older Pre-transition nomenclature, probably 1900 or after. Date can be determined by silver hallmarks. Typical Pre Transition nomenclature, M in Make is under the R. Shape number is three digits or four digits beginning with a 1 (for UK distributed pipes). Barling Early Transition Example: Ye Olde Wood remains but shape number is now four digits not beginning with a 1. First digit indicates size of pipe with 6 being “very large” and 7 being the largest. Pipes marked this way are thought to be late 1962 or 63’. Next version of early Transition Nomenclature: Ye Olde Wood is gone and shape number is four digits not beginning with a 1. First number of shape indicates size. Notice that the M in Make is now under the A. Typical Transition Barling Nomenclature, Barling is now in script. 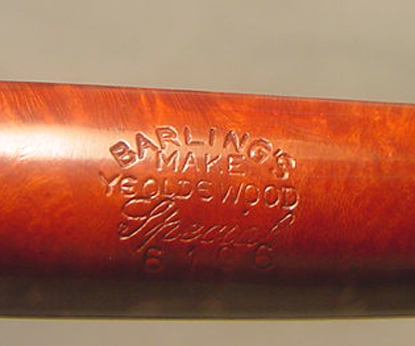 Note Ye Olde Wood is present, with spaces between the words, but Barling is in script and London England. This is an error stamp probably done by factory worker not paying enough attention, or a stamp that was not used for very long. This is the only example of this stamp I have ever seen. The word London exists on a few examples only. This is a rare stamp that was used for a brief period, probably just before the company sold in 1962 or just after. This entry was posted in Pipe and Tobacco Historical Documents, Pipe Related Essays and tagged dating Barling make pieps by stampings, dating Barling pipe, dating Barlings make pipes by stampings, Pipe historical documents, Stories and Essays on September 3, 2013 by rebornpipes. I remember when Eric originally posted this piece on Smokers Forums and I appreciated the work he did on it. I find it a helpful way of explaining tobaccos to newcomers and to refresh my own understanding of the tobaccos that I enjoy. I wrote and asked him if I could reproduce the article for the rebornpipes blog and he graciously consented. Here is Eric’s article on Tobacco Classification. There are as many ways to classify pipe tobacco blends as there are pipe smokers, and then some. However, I have found the following list suits me. I see tobacco blends for the pipe smoker divided into 16 categories. An alternative, earlier, classification was provided by the Pipe Club of Norfolk UK, from which some of the categories originated. However, since this early list, a number of new categories have arisen, such as the Cigar Leaf Blends. Also, a number of pipe smokers have advocated against the terms “English Blends” and “Balkan Blends”, as many tobacco blends actually span the two and there really exists a continuum of sorts. So the terms “English Blends” and “Balkan Blends” have been dropped by many, in favor of the more descriptive terms “Latakia Mixtures”, which in turn is divided into “Light / Medium” and “Medium / Full”. I am aware that this is a highly subjective exercise. And it is to be expected that everyone will have a different take on what constitutes a Touchstone Blend. Also, there will be “lumpers” and “splitters” – that is, those who feel there are too many categories and those who feel the need to split even more. What I hoped to do here, for myself really, was to set up a series of benchmark blends that I could later use as “standards” by which to judge future blends within a category. It is hoped that these lists will provide a jumping off point to begin exploring the wonderful world of pipe tobaccos for others as well. 1. Straight Virginias (non-flake, -rope etc.). 5. Virginia Ropes and Twists. 7. Virginia / Kentucky Blends. 8. Virginia / Burley Blends. 10. Virginia / Perique Blends. 11. Virginia / Perique / Burley Blends. 12. Virginia / Oriental Blends. 13. Light / Medium Latakia Mixtures. 14. Medium / Full Latakia Mixtures. 1. Straight Virginias – non-flake, non-plug, non-ropes & twists. Bulk No. 5100 Red Cake. McClelland Tobacco Company, USA. “This blend is a style of English Virginia that has seldom been seen in the United States. A sweet, exceptionally soft, fully rubbed matured cake”. Fire Cured Virginia. Cut: Ready Rubbed. Bulk. Old Belt Ready Rubbed. W.O. Larsen, DK. “A blend of mature Orange Virginia tobaccos from the Old Belt in Virginia and North Carolina. The blend is lighted pressed into tobacco cakes, which are stored for aging. After cutting, the tobacco is rubbed out to facilitate easy filling of the pipe and an even burn. The tobacco burns exceptionally well with a cool smoke and a well-balanced and supreme natural taste”. Air Cured Virginia. Cut: Ready Rubbed. 100g Tin. Red Ribbon. McCranie’s, USA. “A beautifully aged Red Virginia like no other. Brimming with rich, mellow flavor as only nature can provide. A special allotment of prime 2000 crop North Carolina leaf has been secured for our discriminating pipe smokers. The softest, most enjoyable straight Virginia we’ve ever smoked. With a light vacuum seal, the tobacco will continue to mellow with age”. Air cured Virginia. 50g tin. Virginia No. 1. Mac Baren, DK. “A ready rubbed tobacco, manufactured from a selection of choice, ripe Virginia tobaccos, which gives Virginia No.1 a mild, sweet smoke”. Air cured Virginia. Flavoring: Sweet / sugar. Cut: Ready rubbed. 50g pouch, 100g tin, bulk. Old Gowrie. Charles Rattray, DE. “This blend is a Virginia (with a hint of Perique) tobacco, rubbed-out for a finer cut”. Blender: Kohlhase, Kopp und Co. KG. Air cured Virginia, Perique. Cut: Ready Rubbed. 50g tin, 4oz tin, bulk. Note: Placed here rather than as a Virginia /Perique Blend because of the minor component of Perique. Bulk No. 2010 Classic Virginia. McClelland Tobacco Company, USA. “This is a blend of Eastern and Middle Belt lemon, orange, and orange-red Virginias. A sweet, smooth, and zesty smoke”. Curing Group: Flue Cured. Contents: Virginia. Cut: Broken Flake. Packaging: Bulk. Capstan Medium Navy Cut. Capstan, UK. “A medium to mild blend of carefully selected Virginia tobaccos with a natural aroma enhanced by a subtle flavour”. Curing Group: Air Cured. Contents: Virginia. Cut: Flake. Packaging: 50g Tin. Hamborger Veermaster. Dan Tobacco, DE. “Classic sailor`s flake tobacco made from rich Golden Virginias, sweet and mild.. Curing Group: Air Cured. Contents: Virginia. Cut: Flake. Packaging: 50g tin. Matured Virginias, No. 24. McClelland Tobacco Company, USA. “An unusual form of Flake tobacco, its deep chestnut color results from the extended aging of full flavored Old and Middle Belt leaf very lightly seasoned with Drama. A smooth, robust tobacco good anytime for those who prefer the darker Virginia flavor. Is is especially well suited for outdoor smoking”. Curing Group: Air Cured. Contents: Virginia, Oriental (Drama leaf). Cut: Broken Flake. Packaging: 50g & 100g tin. Hal O’ the Wynd. Charles Rattray, DE. Blender: Kohlhase, Kopp und Co. KG. “A pure Virginian tobacco of a most unusual share of strength. This is a strong, sharp aged red Virginia blend that will perk you up quickly”. Curing Group: Air Cured. Contents: Virginia. Cut: Broken Flake. Packaging: 50g & 100g tin. (Note: The homepage Kohlhase & Kopp says “Kentucky-Virginia-Perique”. Flake rubbed by hand). Note: Many consider this at the top end of the light Virginia Flake Blend, rather than as a full. Fog City Selection: Union Square. G. L. Pease, USA. “A blended, sliced cake of high-grade flue cured leaf, from beautiful, sweet brights to deep, earthy reds, without the added sugars and flavorings common to many Virginia flakes. It’s rich on the palate, evolving in layers with the clean, natural sweetness of pure tobaccos. It offers a pleasant room note, and a delightful finish. For those seeking the pure Virginia experience, try Union Square”. Curing Group: Flue Cured. Contents: Virginia. Cut: Flake. Packaging: 2oz & 8oz tins. Released in May, 2009. Note: Many consider this at the top end of the light Virginia Flake Blend, rather than as a full. Full Virginia Flake. Samuel Gawith, UK. “Samuel Gawith Full Virginia Flake is for lovers of pure pressed Virginias. Created in the heart of Lakeland, the hot-pressed blended Virginias take on a delicious and distinctive dark colour that creates a pipe smokers dream, a feeling of calm, serenity and anticipation of the next pipeful. A “must have” for all Virginia lovers. Medium strength”. Curing Group: Air Cured. Contents: Virginia. Cut: Flake. Packaging: 50g tin. Best Brown Flake. Samuel Gawith, UK. “A firm favourite for the pipe smoker looking for a medium strength, gentle and slow burning tobacco. Manufactured using hand-stripped flue cured Virginias with no flavours added, Best Brown will reward with a cool, sweet smoke with a delectable aroma and good sidestream. Mild to medium”. Curing Group: Flue Cured. Contents: Virginia. Cut: Flake. Packaging: 50g tin. Personal Reserve: Blackwoods Flake. McClelland Tobacco Company, USA. “The characteristic, natural sweetness of mellow, Red Virginias mingles inextricably with the richness and inherently spicy aroma of Black Stoved Virginias in this doubly aged red and black all-Virginia cake mixture. An artistic achievement in tobaccos for the pipe, this beautiful mottled flake is incomparable in smoothness, balance and refinement”. Curing Group: Air Cured. Contents: Virginia. Cut: Broken Flake. Packaging: 50g & 100g tin. Personal Reserve: Dark Star. McClelland Tobacco Company, USA. “Years before tinning, this tobacco begins as bright yellow, sugary top grade Virginia and Carolina leaf. Through careful triple aging, pressing and stoving, it becomes rich, cool and dark. A seductively spicy aroma develops during the extended maturing process to complement the complex flavor of this concentrated, smooth broken flake, which is easily rubbed out to suit any occasion”. Curing Group: Air Cured. Contents: Virginia. Cut: Broken Flake. Packaging: 50g & 100g tin. Marlin Flake. Charles Rattray, DE. Blender: Kohlhase, Kopp und Co. KG. A companion to Old Gowrie. A shade darker, greater strength, different aroma, but otherwise a tobacco in the same tradition”. Curing Group: Flue Cured. Contents: Virginia. Cut: Flake. Packaging: 50g & 100g tin, Bulk. Cut Virginia Plug. Fribourg & Treyer, DE. “ A full bodied, medium to full strength pressed flake. Very complex from start to finish with a well balanced taste that both boldly spicy and subtlety sweet”. Curing Group: Air Cured. Contents: Virginia. Cut: Flake. Packaging: 50g tin. New World Collection: JackKnife Plug. G. L. Pease, USA. “JackKnife Plug – dark-fired Kentucky leaf and ripe red Virginia tobaccos, with their deep, earthy flavors, are layered on a central core of golden flue-cured for a hint of bright sweetness, then pressed and matured in cakes, and finally cut into 2oz blocks. Slice it thick and rub it out for a ribbon cut, thin for a shag, or chop it into cubes. The choice is yours”. Curing Group: Flue Cured. Kentucky, Virginia. Cut: Plug. Packaging: 2oz tin. Introduced in January, 2011. New World Collection: Triple Play. G. L. Pease, USA. “Ripe red and bright flue-cured tobaccos are joined by piquant Acadian Perique and a balanced measure of smoky dark-fired Kentucky. The leaf is pressed and matured in cakes before being cut into 2oz bars, resulting in a bold blend for Virginia and Perique fans”. Curing Group: Flue Cured. Contents: Kentucky, Virginia, Perique. Cut: Plug. Packaging: 2oz bar. Introduced in May, 2011. Peterson’s Perfect Plug. Peterson, IE. Blender: Kohlhase, Kopp & Co. “This excellent plug tobacco comprises selected Virginia leaf from Africa and Brazil blended with Burley leaf from Malawi. The tobaccos are lightly cased before drying and pressing and then are heated and stored for 2 weeks before cutting. The result is a full bodied yet fruity blend, sure to appeal to the experienced pipesmoker”. Curing Group: Air Cured. Contents: Burley, Virginia. Cut: Plug. Packaging: 50g tin. Kendal Plug. Samuel Gawith, UK. “Whoever knows Samuel Gawith knows their famous Kendal Plug. The tobacco has a naturally sweet smell, and when burning it produces a very pleasant aroma. The taste tends to be sweetish, particularly at the beginning, and then slowly the sweetness gives some way to a whole range of taste variations, all very pleasant. It burns so slowly and evenly. A very satisfying smoke”. Curing Group: Flue Cured. Cut: Plug. Note: This may be better placed in the Lakeland category. Black Irish Twist. Gawith, Hoggarth, & Co., UK. “All our twist tobacco varieties are manufactured by the same spinning process using dark fired wrapper leaves. The filler is again, predominantly dark fired leaf with the addition of a small percentage of dark air cured Indian leaf. They are therefore strong tobaccos. Black Twist, because the cooking process removes some of the stronger tar and nicotine elements, provides a milder smoke than the brown twist”. Curing Group: Flue Cured. Contents: Virginia. Cut: Rope. Packaging: Bulk. Brown Rope No. 4. Samuel Gawith, UK. “Twisted forms of aged dark brown leaf. Enormous flavor aroma and strength tamed with slow puffing”. Curing Group: Air Cured. Cut: Rope. Packaging: 50 g tin or Bulk. Sweet Rum Twist. Gawith, Hoggarth, & Co., UK. “This is a twist made from the same ingredients as the Black and Brown Irish X. It has additional Rum flavoring added during manufacture. Again, this is a very strong tobacco as it does not undergo the pressure cooking process”. Curing Group: Air Cured. Contents: Virginia. Flavoring: Rum. Cut: Rope. Packaging: Bulk. Note: This could well be placed as a Lakeland. Best Brown Flake. Samuel Gawith, UK. “A firm favourite for the pipe smoker looking for a medium strength, gentle and slow burning tobacco. Manufactured using hand-stripped flue cured Virginias with no flavours added. Best Brown will reward with a cool, sweet smoke with a delectable aroma and good sidestream. Mild to medium”. Curing Group: Flue Cured. Contents: Virginia. Cut: Flake. Packaging: 50g Tin. Broken Scotch Cake. Gawith, Hoggarth, & Co., UK. ”A very mild blend, using predominantly flue-cured Virginia, but with the addition of some sun-cured both to cool and sweeten the smoke. A rough-cut into very coarse pieces also contributes to cooling the smoke”. Curing Group: Flue Cured. Contents: Virginia. Cut: Coarse Cut. Packaging: 50g tin & Bulk. Dark Birdseye. Gawith, Hoggarth, & Co., UK. “Manufactured from Dark tobacco ‘whole leaf’ rather than strips, the mid-rib (or stem) gives the ‘birds eye’ effect when cut. A strong smoke which was particularly favored by the fishermen as the finer cut meant the tobacco was easier to light and to keep-in on board ship when the weather was bad”. Curing Group: Flue Cured. Contents: Virginia. Cut: Ribbon. Packaging: Bulk. Ennerdale Flake. Gawith, Hoggarth & Co., UK. “Our best selling flake by a wide margin. Predominately virginia leaf from Brazil, Zimbabwe and Malawi (86%) but with the addition of sun cured Malawi (10%) to add sweetness, strength and to cool the smoke and Malawi Burley (4%) to “carry the flavour” in addition to its cooling and strength qualities. (Burley is very good at absorbing casings and flavours) A background flavour of Almond is enhanced with the addition of fruit flavours, vanilla, and the special ‘English type’ flavours which give this tobacco its distinctive, yet typical ‘English’ Aroma associated with the UK best selling brands such as Condor, St Bruno and mellow Virginia”. Curing Group: Air Cured. Contents: Burley, Virginia. Flavoring: Fruit / Citrus, Almond, Vanilla. Cut: Flake. Packaging: 50g tin, Bulk. Bob’s Chocolate Flake. Gawith, Hoggarth, & Co., UK. “The main characteristics of this flake come from the 8% Latakia included in the blend and the smooth chocolate aroma. Brazilian, Zimbabwe, Malawi virginia leaf make up 82% of the blend providing a mild/Medium smoke cooled with the addition of 8% Malawi sun cured and 2% Malawi Burley. The latakia cools but does also add strength and aroma. The cocoa casings and chocolate top flavours are rounded off with vanillas and other flavours providing sweet notes”. Curing Group: Air Cured. Contents: Burley, Virginia, Latakia. Flavoring: Alcohol /Liquor, Cocoa / Chocolate, Vanilla. Cut: Flake. Packaging: 50 tin & bulk. Rum Flake. Gawith, Hoggarth, & Co., UK. “The ‘Christmas cake’ of all our tobaccos. A very rich, sweet fully flavoured blend. The main feature is the high proportion of naturally sweet sun-cured tobaccos in the blend – over 40% Only 30% Virginia leaf, with the rest of the blend coming from burleys and Dark-air cured contribute to a strong, but rewarding smoke. The whole blend is cased in maple sugars to further enhance the natural sweetness of the sun cured leaf and then rounded off with a dash of rum”. Curing Group: Air Cured. Contents: Burley, Virginia. Flavoring: Rum, Maple. Cut: Broken Flake. Packaging: 50g tis & bulk. 660: Silver Flake. Solani, DE. Blender: R.L. Will. “An incredible blend of premium dark red and sweet Virginias from the “border belt”, light yellow Virginia from South Carolina and dark-fired, spicy Kentucky. Slow burning and because no flavoring has been added, this blend has a real tobacco taste”. Curing Group: Air Cured. Contents: Kentucky, Virginia. Cut: Flake. Packaging: 50g & 100g tin. Three Nuns Original. Bell’s. Blender: Orlik Tobacco Company A/S, DK. “A blend of dark fired and sun cured tobaccos mixed with the finest Brazilian Lights to produce the unique flavour and mellow smoking characteristics for which Three Nuns is famous”. Curing Group: Flue Cured. Contents: Kentucky, Virginia. Cut: Curly Cut. Packaging: 50 or 100g tins. Note: In the original formula, from Imperial Tobacco, Three Nuns was a VA-PER mixture. Original Mixtures: Cumberland. G. L. Pease, USA. “Robust and possessing a subdued sweetness, Cumberland is a delightfully orchestrated suite of American tobaccos, featuring a rare and exquisite mahogany Kentucky, aged in bales for twenty years. Red and matured Virginias establish a theme; the Kentucky and a pianissimo of Perique create the variations. Pure, natural tobacco flavors are harmonized by delicate arpeggios and underscored by deep, resonant tones. The coda is lovely and lingering – a perfect finish to a rich performance. Best savored slowly”. Curing Group: Flue Cured. Contents: Kentucky, Virginia, Perique. Cut: Coarse Cut. Packaging: 2oz & 8oz tin. Introduced in April, 2002. Note: An unusual blend that is not really a touchstone for this category. Golden Sliced (Red). Orlik Tobacco Company A/S, DK. “A delightful blend of golden and full body Virginibesta tobaccos with a touch of Burley. A fine natural sweetness in taste and aroma characterizes Orlik Golden Sliced. The cut is the traditional Navy Cut Flake i.e. pressed tobacco and cut into slices. Rub the tobacco slices gently before filling your pipe”. Curing Group: Flue Cured. Contents: Burley, Virginia. Cut: Flake. Packaging: 50g Pouch, 50g & 100g tins. Long Golden Flake (No. 71). Reiner, DE. Blender: R.L. Will. “A very special blend of golden Virginias, a little “white” Burley, and a touch of Perique to make things interesting. Pressed into long flakes, sliced, then rolled in the tin in long strips”. Curing Group: Flue Cured. Contents: Burley, Virginia, Perique. Cut: Flake. Packaging: 100g tin. University Flake. Peterson, IE. Blender: Kohlhase, Kopp & Co. “Originally manufactured in Ireland by Murray, and now manufactured in Germany by Kohlhase & Kopp. The new tin description reads “An easy smoking blend of fine Virginias and Burley tobaccos, made the traditional way.” Curing Group: Air Cured. Contents: Burley, Virginia. Flavoring: Plum. A light, berry-like top dressing applied that is evident in the smoke. The K&H website describes it as “pflaume” which is the German word for plum. Cut: Flake. Packaging: 50g Tin. Original Mixtures: Barbary Coast. G. L. Pease, USA. “The finest cube-cut Burley, chosen for its deep, nutty flavors, forms a robust foundation for this sophisticated blend. Rich, red Virginia tobaccos are added for their subtle sweetness and complexity, while the unique spice of Perique provides added dimension. A delicate kiss of Brandy polishes the blend to a perfect finish. Barbary Coast is delightfully satisfying, with hints of black walnut, dark chocolate, and dried fruits. The perfect “all-day” smoke”! Curing Group: Sun Cured. Contents: Burley, Virginia, Perique. Flavoring: Brandy. Cut: Cube cut. Packaging: 2oz & 8oz tin. Introduced in March, 2001. Note: The addition of a brandy casing and a component of Perique make this an unusual blend – a type of aromatic burley. Stonehaven. Esoterica Tobacciana, J.F. Germain & Son, UK. “A marriage of air-cured leaf and Burley with selected dark Virginia. Hard pressed and aged to produce brown flakes with dark undertones. A traditional English flake favored by experienced pipe smokers”. Curing Group: Air Cured. Contents: Burley, Virginia. Cut: Flake. Packaging: 8oz bag. Note: A highly atypical blend -definitely not a touchstone blend for the category. Included here to illustrate the absolute limits of the style. An oddball and an “envelope pusher” – but worth trying when available. Carter Hall. John Middleton, Inc., USA. “Burley blended smoking mixture”. Curing Group:Air Cured. Contents: Burley, Virginia. Cut: Ribbon. Packaging: 1.5oz Pouch. Prince Albert. John Middleton Inc., USA. “Crimp-cut, mild smoking mixture. Made in the USA”. Curing Group: Air Cured. Contents: Burley, Virginia (minor). Cut: Ribbon. Half & Half. Pinkerton Tobacco, USA. “Burley based pipe tobacco. Made in the USA”. Heavy casing of Anise. Curing Group: Air Cured. Contents: Burley, Virginia. Flavoring: Anise. Cut: Ribbon. Packaging: 50g Pouch, 100g Tin. Note: Originally from an American Tobacco 19th century formula. Originally, it was a local Virginia favorite for both cigarettes and pipe tobacco. Burley London Blend. Mac Baren, DK. “Introduced in 1965 and consists mainly of carefully selected Burley tobaccos. Just a little Virginia has been added to give the blend a natural sweetness. You will notice the slight natural chocolate note, which is found in all good Burley tobacco. The very special top flavor in combination with the tobaccos gives you a very distinct smoking pleasure”. Curing Group: Sun Cured. Contents: Burley, Virginia (minor). Flavoring: Cocoa /Chocolate. Cut: Ribbon. Packaging: 100g Tin. Navy Flake. Mac Baren, DK. “A mild flake blended from the finest Burley tobaccos with added ripe Virginias and Cavendish. Navy Flake is light burning, making the lighting of the pipe very easy”. Curing Group: Air Cured. Contents: Burley, Cavendish, Virginia, Flavoring: Rum. Cut: Flake. Packaging: 50g Pouch, 100g tin. Introduced in 1965. Wilke Nut Brown Burley. Pipeworks & Wilke, USA. Blender: Carole Burns. “A distinctive blend of aged cube cut Burley. An old fashioned slow burning tobacco with a naturally pleasant aroma, and no added sweeteners”. Curing Group: Air Cured. Contents: Burley, Virginia, Turkish. Cut: Cube. Packaging: Bulk. Escudo Navy Deluxe. Peter Stokkebye, DK. “A combination of full bodied Virginia from North Carolina and Virginia blended with Perique from Louisiana are the cornerstones in Escudo. The blend is pressed and matured before it is spun and cut into coins. This process ensures the unique character of Escudo. Produced by the Cope brothers from 1870 to 1936, at which point they were bought by Gallaher. Gallaher produced Escudo until 1994. A&C Petersen began production in 1997, with the original presses. Now blended by Peter Stokkebye, imported and distributed by Villager Stokkebye International”. Curing Group: Air Cured. Contents: Virginia, Perique. Cut: Curly Cut / Coins. Packaging: 50g tin. St. James Flake. Samuel Gawith, UK. “A sumptuous blend of Virginias and Perique, this big, bold British style flake incorporates a generous proportion of St. James Parish, LA perique”. Curing Group: Flue Cured. Contents: Virginia, Perique. Cut: Flake. Packaging: 50g Tin. Luxury Bullseye Flake. Peter Stokkebye, DK. “A blend of ripe Virginia tobacco spiced with pure Louisiana Perique. The distinctive aroma of Perique combined with the natural sweetness of Virginia tobaccos provides a wonderful characteristic taste. The center of mellow, fermented Black Cavendish serves to smoother the general impression and rounding the taste. It is all a handcrafted process from selecting the best tobacco, blending, rolling, cutting, and packing. The result is an unparalleled smoking experience”. Curing Group: Air Cured. Contents: Black Cavendish, Virginia, Perique. Cut: Curly Cut. Packaging: Bulk. 633 Virginia Flake with Perique. Solani, DE. Blender: R.L. Will. “A matured virginia, pressed flake, with premium perique”. Curing Group: Air Cured. Contents: Virginia, Perique. Cut: Flake. Packaging: 50g tin. Bayou Morning Flake. Cornell & Diehl, USA. Blender: Bob Runowski. “Bayou Morning Flake is a much different tobacco from original bayou Morning. This is a very dark brown crumbly flake. To my taste it is very mellow and smooth with just the right amount of Perique”. Curing Group: Flue Cured. Contents: Virginia, Perique. Cut: Broken Flake. Packaging:50g tin. Fog City Selection: Fillmore. G. L. Pease, USA. “A thick-sliced, broken flake in the Scottish tradition. Ripe red Virginia tobaccos are combined with a generous measure of fine Louisiana Perique, and then pressed to marry the components and deepen the flavors. The cakes are sliced and gently broken before tinning. Fillmore presents an elegant sweetness and delightful piquancy, enhanced by a creamy richness that develops throughout the bowl. Sit back, and enjoy a lovely,leisurely smoke”! Curing Group: Air Cured. Contents: Virginia, Perique. Cut: Broken Flake. Packaging: 2oz tin. Released in June, 2006. Bulk No.2015 Virginia Flake. McClelland Tobacco Company, USA. “This tobacco is made from rich, orange and Red Virginias to which enough St. James Perique has been added to create a refreshing smoke”. Curing Group: Flue Cured. Contents: Virginia, Perique. Cut: Broken Flake. Packaging: Bulk. Luxury Navy Flake. Peter Stokkebye, DK. “Very mature Old Belt flue-cured Virginia’s spiced with Louisiana Perique”. Curing Group: Flue Cured. Contents: Virginia, Perique. Cut: Flake. Packaging: Bulk. Personal Reserve: St. James Woods. McClelland Tobacco Company, USA. “A highly sophisticated broken Flake of matured Red and Black stoved Virginias pressed with the finest Louisiana Perique. This beautiful, mottled tobacco has an especially deep, rich character with that mysterious and compelling aroma that is Perique’s alone. A truly satisfying delight for natural Virginia pipe tobacco”. Curing Group: Fire Cured. Contents: Virginia, Perique. Cut: Broken Flake. Packaging: 50g & 100g tin. Original Mixtures: Haddo’s Delight. G. L. Pease, USA. “Haddo’s Delight is a stout blend of several Virginia tobaccos with a generous measure of long-cut Perique. Unflavored Green River black Cavendish and a little air-cured white Burley ribbon provide fullness, body, and a bit of extra strength. Finally, an exclusive process darkens and marries the mixture, and gives the blend a subtle tin aroma of cocoa and dried fruit. The flavor is full on the palate, earthy, slightly sweet and intriguingly piquant, with overtones of figs and raisins. A wonderful blend for the Perique lover”! Curing Group: Air Cured. Contents: Burley, Black Cavendish, Virginia, Perique. Cut: Ribbon. Packaging: 2oz, 8oz & 16 oz tins. Introduced in August, 2000. 126: Old Joe Krantz. Cornell & Diehl, USA. Blender: Bob Runowski. “Ribbon and coarse cut burleys, perique and red virginia. Shades of brown with the characteristic mustiness of perique”. Curing Group: Air Cured. Contents: Burley, Virginia, Perique, Cut: Coarse Cut. Packaging: Bulk. Exhausted Rooster. Cornell & Diehl, USA. Blender: Toney / Tarler. “C&D’s annual blend for the 2008 Chicago Show. A tasty flake of Virginias, Dark Fired Burley and a dash of Perique”. Curing Group: Air Cured. Contents: Burley, Virginia, Perique. Cut: Broken Flake. Packaging: 2 & 8 oz tins. 107: Haunted Bookshop. Cornell & Diehl, USA. Blender: Bob Runowski. “A predominantly Burley mixture with a touch of red Virginia and Perique”. Curing Group: Air Cured. Contents: Burley, Virginia, Perique. Cut: Ribbon. Packaging: Bulk. Note: some may place this blend in the Virginia / Burley Blend category on account of the heavy influence of the burley, but the inclusion of Perique brings it here. Original Mixtures: Cairo. G. L. Pease, USA. “Cairo is a wonderfully complex mixture of red, orange and bright Virginia tobaccos, exotic oriental leaf, and just a whisper of Perique. The flavor is naturally sweet, slightly nutty, delicately spicy and rich. Subtle citrus-like notes harmoniously support the more robust flavors of the darker Virginias. A medium-bodied tobacco with a delicate aroma, Cairo will satisfy Virginia lovers and the connoisseur of oriental mixtures alike”. Curing Group: Air Cured. Contents: Virginia, Perique, Oriental. Cut: Ribbon. Packaging: 2 & 8 oz tins. Introduced March, 2000. Note: Due to the presence of Perique, some may wish to acknowledge this as a Virginia / Perique Blend, however to my palate the Perique is a very insignificant component to this blend. Fog City Selection: Embarcadero. G. L. Pease, USA. “Rich, ripe red virginias are combined with top-grade Izmir leaf, pressed and aged in cakes, then sliced into flakes and tinned. The result is a wonderfully fragrant, natural blend with subdued sweetness, more “brut” than “demi-sec”, delightful toasty flavors, and hints of nuttiness and roasted coffee. Satisfying and refreshing; a comforting smoke, with enough complexity to keep it interesting”. Curing Group: Air Cured. Contents: Virginia, Turkish (Izmir Leaf). Cut: Coarse Cut. Packaging: 2 & 8 oz tins. Introduced July, 2007. Dunhill Early Morning Pipe. Orlik Tobacco Company A/S, DK. “Sweet Oriental carefully blended with Bright and Red Virginias, pressed and lightly stoved. Great as the `first pipe` arousing the palate for the further pleasures of the day”. Curing Group: Air Cured. Contents: Virginia, Oriental. Cut: Ribbon. Packaging: 50g. Tin, 100g Tin. Previously released by Murray’s and Sons, UK. Bulk No. 2045 Oriental Mixture. McClelland Tobacco Company, USA. “This is a soft and sweet, rich in light Orientals and Carolina tobaccos with less Latakia than No.2040. Curing Group: Flue Cured. Contents: Virginia, Latakia (slight), Orientals. Cut: Broken Flake. Packaging: Bulk. Oriental No. 14. McClelland Tobacco Company, USA. ”Dark with Latakia and Black Virginias, deeply seasoned with Orientals, this is the classic full Scottish smoke”. Curing Group: Air Cured. Contents: Virginia, Latakia, Oriental. Cut: Ribbon. Packaging: 50g Tin, 100g Tin. Grand Orientals: Drama Reserve. McClelland Tobacco Company, USA. “The famed Drama leaf is sweet and subtle with a natural olive oil fragrance. It is grown on the Southern slopes and foothills of the Rhodope Mountains, the Classic Drama Basma District in Greek Eastern Macedonia, and includes the renowned Mahalia. It is refreshing, delicate, intriguing. This blend is designed to demonstrate just why the classic top-grade Drama leaf is so celebrated”. Curing Group: Air Cured. Contents: Virginia, Oriental. Cut: Ribbon. Packaging: 50g & 100g tin. Campanile. James Fox, DE. Blender: Planta. “A blend of Virginian and flavoured with pure Turkish leaf. It embodies absolutely no black tobaccos and is a blend which is delightfully smooth and sweet down to the last shred”. Curing Group: Air Cured. Contents: Virginia, Turkish. Cut: Ribbon. Packaging: 50g Tin. Oriental. Robert McConnell, DE. Blender: Kohlhase, Kopp und Co. KG.”A century old formula, traditional mixture of Oriental and Virginia tobaccos. The formula contains a big fatty amount of Macedonia, Virginia Bright, Red Virginia and Cavendish added for even more sweetness”. Curing Group: Air Cured. Contents: Cavendish, Virginia, Oriental. Cut: Ribbon. Packaging: 50g Tin. Oriental No. 40. Peretti, USA. “A blend entirely made of tobaccos from the Near East. It has richness and full flavor”. Curing Group: Air Cured. Contents: Virginia, Oriental, Turkish. Cut: Ribbon. Packaging: Bulk. Original Mixtures: Caravan. G. L. Pease, USA. “Rich, smoky Cyprian Latakia and a variety of wonderful Oriental tobaccos set the stage for the blend. Lemon and Red Virginias provide support, while adding a hint of sweetness. Finally, just a touch of air cured leaf is added for body. Caravan is full and exotic; rich and spicy. A classic Balkan style blend with our own special touch”. Curing Group: Fire Cured. Contents: Burley, Virginia, Latakia, Oriental. Cut: Ribbon. Packaging: 2 & 8oz tins. Note: Because of the presence of Latakia, GL Pease’s Caravan is placed here in the “Light / Medium Latakia” category, however, to my palate, the Latakia presence is subservient to the Virginias and Orientals which predominate, which could lead some to place this as an “Virginia / Oriental Blend”. Fog City Selection: Ashbury. G. L. Pease, USA. “An alluring assortment of exotic oriental tobaccos is generously blended with bright and red Virginia leaf. Finally, just enough Cyprus Latakia is added to provide an alluring smokiness, resulting in a tobacco that can best be described as a light-medium Balkan mixture. This is the blend for gentlemen with a Bohemian spirit and a sense of adventure”. Curing Group: Air Cured. Contents: Virginia, Latakia, Oriental. Cut: Coarse Cut. Packaging: 2oz Tin. Released in October, 2005. Old London Series: Chelsea Morning. G. L. Pease, USA. “Sweet red and bright Virginias, fragrant orientals, a bit of rich Cyprus Latakia, and just a pinch of Perique. The leaf is blended in layers, briefly pressed, then sliced and tumbled into ribbons. Lively and engaging, with a subtle fruitiness, and an elegant, creamy texture, it’s a great bowl to accompany the morning cup”. Curing Group: Flue Cured. Contents: Virginia, Latakia, Perique, Oriental. Cut: Ready Rubbed. Packaging: 2oz & 8oz tins. Introduced in October, 2009. Classic Collection: Blackpoint. G. L. Pease, USA. “Blackpoint is a luxurious blend of red and lemon Virginias, Cyprian Latakia, exotic oriental tobaccos, and a perfect measure of Louisiana perique for a lively, piquant finish. The smoke is creamy and lingering, engaging the palate with a mouth-filling array of wonderful flavours. Reminiscent of raisins and stewed figs, fireplaces in the fall, walks in the forest… Perhaps the most complex in the collection. Perfect for evenings”. Curing Group: Flue Cured. Contents: Virginia, Latakia, Perique, Orienta. Cut: Ribbon. Packaging: 2oz & 8oz tins. Released in March, 2003. Classic Collection: Kensington. G. L. Pease, USA. “Kensington is a Balkan style blend with restraint. Bright and red Virginias are combined with richly flavoured leaf from the orient and Cyprian Latakia in perfect measure for a wonderfully balanced smoke. Slightly sweeter than Charing Cross, and not quite as full due to a more delicate hand with the Latakia. Spicy, with an occasional suggestion of orange blossom. Complex, but never ponderous. A slightly lighter variant of the classic style”. Curing Group: Flue Cured. Contents: Virginia, Latakia, Oriental. Cut: Ribbon. Packaging: 2oz &, 8oz tins. Released in March, 2003. Dunhill London Mixture. Orlik Tobacco Company A/S, DK. “Skillfully blended Latakia with Virgina and Turkish. Pleasant aroma and a flavor never tiring”. Curing Group: Air Cured. Contents: Virginia, Latakia, Turkish. Cut: Ribbon. Packaging: 50g Tin. Previously released by Murray’s and Sons, UK. Dunhill Standard Mixture Medium. Orlik Tobacco Company A/S, DK. “Latakia, Orientals, East Carolina and Georgian, all lightly toasted. A slightly heavier companion to DUNHILL’s Standard Mixture Mild. Traditional English”. Curing Group: Flue Cured. Contents: Virginia, Latakia, Oriental. Cut: Ribbon. Packaging: 50g Tin. Previously released by Murray’s and Sons, UK. And So To Bed. Esoterica Tobacciana, J.F. Germain & Son, UK. “Finest grade Virginia and Maryland type tobaccos are carefully aged and blended with Greek Oriental” leaf and top-grade Cyprian Latakia. The blend is then specially processed and additionally matured to produce a mellow full strength smoke with rich flavor and unique aroma”. Curing Group: Air Cured. Contents: Burley, Virginia, Latakia, Oriental, Maryland. Cut: Ribbon. Packaging: 50g Tin. Margate. Esoterica Tobacciana, J.F. Germain & Son, UK. “A classical English mixture done in the “old style” of many of the fine tobaccos that have now disappeared from the market place. Choice Orientals and generous quantities of premium Cyprian Latakia keynote this rich, full bodied blend. A well balanced, robust and eminently satisfying smoke”. Curing Group: Air Cured. Contents: Latakia, Oriental. Cut: Ribbon. Packaging: 50g Tin, 8oz. Note: This blend could just as easily be placed in the “Medium / Full Latakia Mixture”, however, to my palate, the Orientals ride over the Latakia here. Squadron Leader. Samuel Gawith, UK. “Bright and Dark Virginias blended together with Latakia and Turkish leaf to make this a cool medium bodied smoke”. Curing Group: Air Cured. Contents: Virginia, Latakia, Turkish. Cut: Ribbon. Packaging: 50g Tin. Note: I have placed this blend here, rather than under Virginia / Oriental Blends, because of the presence of the Latakia component. Bald Headed Teacher. 4noggins, USA. Blender: Rich Gottlieb. “The old-fashioned burley taste comes through in full form, nutty and brisk, hitting on tangy notes along the way as the Virginia components catch on. There’s just enough Latakia to provide no more than perhaps a seasoning effect”. Curing Group: Air Cured. Contents: Burley, Virginia, Latakia. Cut: Ribbon. Packaging: Bulk. Note: Some may place this blend in the Virginia / Burley Blend category, however, the presence of Latakia suggests a Light / Medium Latakia Mixture placement. 101: Morley’s Best. Cornell & Diehl, USA. Blender: Bob Runowski. “This is a combination of three Burleys (rough cut, white & cubed), Virginia flake and Cyprian Latakia”. Blend Notes: Reminiscent of old original Blue Boar blend. Curing Group: Air Cured. Contents: Burley, Virginia, Latakia. Cut: Coarse cube cut. Packaging: Bulk. Note: Some may place this blend in the Virginia /Burley Blend category, however, the presence of Latakia suggests a Light /Medium Latakia Mixture placement. Frog Morton. McClelland Tobacco Company. “An exceptionally dark, rich and full Latakia Mixture designed for those who desire really satisfying Latakia flavor but want a pipe tobacco soft enough to smoke anytime. It took Frog Morton four years designed for smoking in quiet serenity. It is his proudest achievement”. Curing Group: Air Cured. Contents: Virginia, Latakia. Cut: Ribbon. Packaging: 50g Tin, 100g Tin. Frog Morton across the Pond. McClelland Tobacco Company, USA. “Remarkably cool-smoking, delightfully fragrant. Frog Morton journeyed far across the pond to find the exotic components for this rich, smooth pipe tobacco blend enhanced with rare Syrian Latakia. He says it was worth the trip”. Curing Group: Air Cured. Contents: Virginia, Latakia, Oriental. Cut: Ribbon. Packaging: 50g Tin, 100g Tin. Frog Morton on the Town. McClelland Tobacco Company, USA. “Frog Morton formulated this exceptionally mellow blend, fragrant with Basma, smooth and rich with Latakia, for his evening at the opera. This is an elegant companion to the original, soft, full Latakia blend. Curing Group: Air Cured. Contents: Latakia, Oriental, Turkish. Cut: Ribbon. Packaging: 50g Tin, 100g Tin. Esoterica: Penzance. “A wonderful complex secret recipe of the finest Virginias, choice Turkish and Orientals and Cyprian Latakia, all hand blended together, hard pressed and broad cut into thick flakes. Long matured and easily crumbled to facilitate pipe filling. This is one of the finest traditional English Flakes available anywhere”. 066. Star of the East. Cornell & Diell, USA. “One half Latakia with a generous portion of Turkish and sweetened with stoved red Virginia”. Curing Group: Air Cured. Contents: Virginia, Latakia, Turkish. Cut: Ribbon. Packaging: Bulk. Captain Earles: Ten Russians. “Ten Russians is a true delight for lovers of Latakia. Rich and full bodied, it is pressed to deliver a perfectly balanced blend to the true aficionado of full English tobaccos”. Heirloom Collection: Westminster. G.L. Pease, USA. “The very essence of the traditional English mixture; rich, elegant, refined, and exquisitely balanced. New World red Virginias are enhanced with a gentle caress of bright leaf, then lavishly seasoned with rich oriental tobaccos and generous measures of noble Cyprus mountain Latakia. Westminster is a satisfying blend, presenting layers of flavor to delight the senses and develop in the bowl. A perfect everyday English mixture. Full-bodied”. Curing Group: Fire Cured. Contents: Virginia, Latakia, Orientas. Cut: Ribbon. Packaging: 2oz & 8oz tins. Introduced in January, 2007. Note: A detailed review of the blend has been posted at Luxury Tobacco Reviews. Original Mixtures: Odyssey. G.L. Pease, USA. “Odyssey is huge – the biggest of the Pease blends. It’s loaded with Latakia and harmonized by exotic Orientals. Wonderful red and jet-black stoved Virginias provide a perfect counterpoint”. Curing Group: Fire Cured. Contents: Virginia, Latakia, Oriental. Cut: Ribbon. Packaging: 2oz & 8oz tins. Released in January, 2002. Classic Collection: Abingdon. GL Pease, USA. “Abingdon is the fullest Balkan style blend in the range. It is rich and robust, powerful and forthright, yet still possessing subtlety and finesse. Dark flavors of wood and leather mingle with delicate undercurrents of sweetness, and deep earthy notes, while the oriental tobaccos provide hints of their verdant, sometimes herbaceous character. A big Balkan blend, reminding us once more of what these blends used to be. Because of the high percentage of dark and oriental tobaccos, it’s recommended to pack Abingdon a little less firmly than you might a lighter blend”. Curing Group: Fire Cured. Contents: Virginia, Latakia, Oriental, Turkish. Cut: Ribbon. Packaging: 2oz & 8oz tins. Released in July, 2003. Classic Collection: Charing Cross. G.L. Pease, USA. “Charing Cross is a traditional Balkan style blend of fine Virginia leaf, richly seasoned with smoky Cyprian Latakia, and spiced with the exquisite and exotic tobaccos of the orient. This is the one for Latakia lovers. Hints of roasted cocoa beans, orange zest, green pepper and campfires. This is the big one – fuller than Blackpoint, and a little less sweet”. Curing Group: Flue Cured. Contents: Virginia, Latakia, Orienta. Cut: Ribbon. Packaging: 2oz & 8oz tins. Released in March, 2003. Commonwealth Mixture. Samuel Gawith, UK. “Tin Description: 50% heavily steamed Virginia & 50% Cyprus Latakia. Cornell & Diehl: Pirate Kake. “A smooth, robust blend with LOTS of exceptional Latakia accompanied by Turkish and cavendish cut Burley. This is the blend for the Latakia lover. No Virginias. Latakia at 70%”. GL Pease. Key Largo. “Deep, Earthy and Creamy. A distinguished broken flake of Red Virginia tobaccos, small leaf orientals, and a measure of Cyprus Latakia, spiced with velvety cigar wrapper leaf. Key Largo develops throughout the bowl, offering a satisfying and sturdy smoking experience, with beautifully balanced, richly textured layers of cocoa, dark roasted coffee, leather, and a lively, lingering finish”. Cornell & Diehl: Habana Daydreams. “A flavorful blend of Virginias with Perique and unsweetened Black Cavendish. The mixture also features a dash of Latakia and a spoonful of cigar leaf”. Cornell & Diehl: Billy Budd. “A heavy Latakia blend with rough-cut burley, bright Virginia flake and a good amount of rough-cut cigar leaf”. Lane’s 1Q Pipe Tobacco. “Lane’s 1Q Pipe Tobacco is amazingly popular. Void of any factory packaging and very unremarkably named, it’s surprising that Lane 1Q pipe tobacco easily ranks among the best-selling pipe tobacco in the world. But just a few puffs in, you’ll realize why. The tobacco selection consists of a perfectly proportioned blend of Golden Cavendish complimented by a touch of fire-cured Cavendish. Mellow in body, but big on flavor, this smooth, aromatic tobacco delivers a rich, sweet, and smooth experience that’s layered with notes of vanilla, oak, and fruit”. Mac Baren: 7 Seas Regular. “Black Cavendish and Golden Burleys. A soft and exceptionally mellow smoke combined to create a delightful, aromatic taste”. Captain Black: Regular (White). “The Captain Black blends are a line of aromatic Cavendish concoctions that enjoy an immensely widespread popularity the world over. This, the original mixture, combines rich black Cavendish with mellow Burleys”. Cornell & Diehl: Autumn Evening. “A Red Virginia cavendish cased with a delicate maple flavor. An exceptionally smooth aromatic”. Boswell’s Aromatic Blends. Berry Cobbler. “Hints of spice in the aroma that reminds me of a berry cobbler just out of the oven. Intense fruit aromas with a taste that is smooth the whole time. A light smoke and definitely a crowd pleaser”. Boswell’s Aromatic Blends. Christmas Cookie. “Very mild blend which Dan has created by hand to maintain each tobacco’s individual characteristics. Christmas Cookie, tempts the most discriminating palate. Creates a delightful aroma. The name says it all. Created Nov. 2002. Here is an ideal tobacco for a Christmas gift, a tobacco that every pipe smoker will enjoy as a real Holiday Treat”! This entry was posted in Pipe Related Essays and tagged Eric Boehm, pipe tobacco classifcation, pipe tobacco classification schemes, Pipe Tobacco options, Pipe tobaccos, Touchstone tobaccos on September 3, 2013 by rebornpipes. In my experience Bas Stevens is one of the foremost authorities on Stanwell pipes. Whenever I find a shape I need information on or a pipe that I need help identifying the shape or the carver I email Bas and he has the information readily at hand. I picked up this shape listing from him some time ago and it identifies the shape by number and by designer. I found it extremely helpful so I wrote Bas and asked if I could post it here. Bas granted gracious permission and below is what Bas has provided. a) Freehand, straight, angled rim, named Nefertite, by Sixten Ivarsson – late 1950s. a) Freehand, oval bowl and stem, by Sixten Ivarsson. b) Bent, egg-shaped bowl, sloping top, full mouthpiece. 3. Billiard medium size, full mouthpiece. 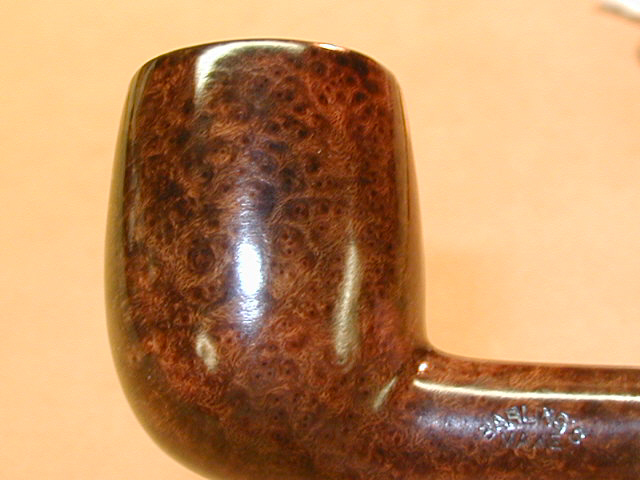 a) Lovat with long stem. a) Dublin style by Sixten Ivarsson – 1951.
b) Freehand, large bent sitter, saddle mouthpiece. 7. Panel Free Hand, Free Hand w/panel or rectangular shank. a) Slight bent, oval stem, full mouthpiece, by Sixten Ivarsson. b) Bent, triangular stem, saddle mouthpiece. 8. Bent with push mouthpiece by Sixten Ivarsson. 9. Freehand, slightly bent, triangular bowl, special design mouthpiece, by Sixten Ivarsson. a) Tulip bowl, oval stem, special design mouthpiece, by Sixten Ivarsson. b) Bent with push mouthpiece by Sixten Ivarsson. a) Billiard bowl, slightly bent, oval stem, by Sixten Ivarsson. b) Large pot, slightly bent, saddle mouthpiece, by Sixten Ivarsson. 11R. Bulldog, bent, with long shank and long full mouthpiece by Anne Julie. Billiard w/saddle stem, Canted Pear by Sixten Ivarsson. a) Pear-shaped bowl, oval stem, saddle mouthpiece, by Sixten Ivarsson. b) Large billiard, saddle mouthpiece. 14. 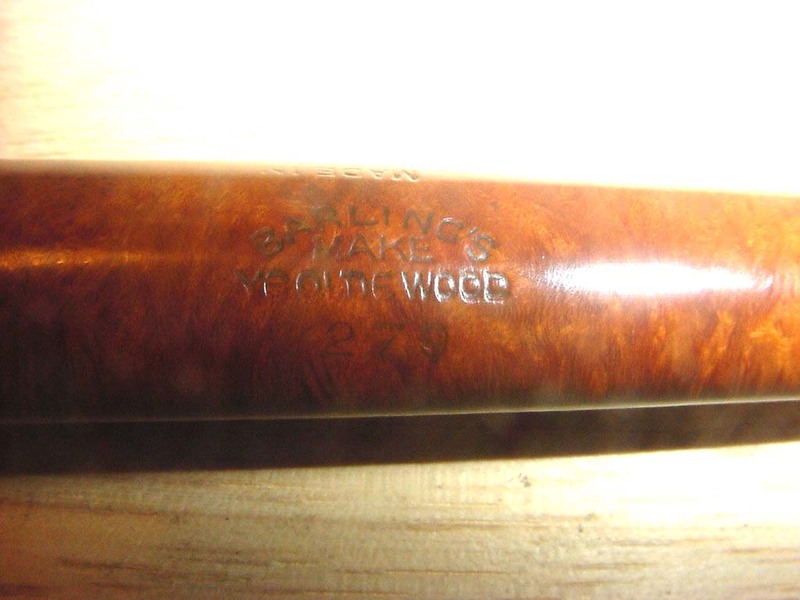 Large billiard, saddle mouthpiece. 16. Billiard, long stem, full mouthpiece. 17. Small billiard, rounded rim, saddle mouthpiece, by Sixten Ivarsson. 18. Pear-shaped bowl, slightly bent, oval stem, saddle mouthpiece, by Sixten Ivarsson. 19. Bent, triangular bowl, saddle mouthpiece. a) Freehand, boat-shaped, special design mouthpiece, by Sixten Ivarsson. b) Freehand, large bent, saddle mouthpiece, by Sixten Ivarsson. 21. Bent, triangular bowl, saddle mouthpiece. a) Billiard, oval stem, full mouthpiece. b) Bent, flat bottom, saddle mouthpiece. 23. Freehand bent, rounded rim, saddle mouthpiece, by Sixten Ivarsson. a) Freehand, slightly bent, oval stem and mouthpiece, by Sixten Ivarsson. b) Freehand, push mouthpiece, by Sixten Ivarsson. a) Same as 24a but larger, by Sixten Ivarsson. b) Freehand, slightly bent, oval bowl, rounded top, saddle mouthpiece. 26. Freehand, slightly bent, oval, by Anne Julie. 27. Billiard, slightly bent, stem with metal ring, push mouthpiece. 29. Billiard, medium size, full mouthpiece. 30. Freehand, bent, “Strawberry”, saddle mouthpiece, by Sixten Ivarsson. b) Freehand, large shape 30, by Sixten Ivarsson. a) Bulldog, saddle mouthpiece, Stanwell’s first pipe shape from 1942.
b) Freehand, bent, saddle mouthpiece, by Sixten Ivarsson. Redesigned by Tom Eltang in the early 1990s. b) Bulldog, bent, push mouthpiece. a) Bulldog, slightly bent, sloping bowl, full mouthpiece, by Sixten Ivarsson. b) Bulldog, slightly bent, push mouthpiece, by Sixten Ivarsson. a) Freehand, bent, saddle mouthpiece, by Sixten Ivarsson. b) Freehand, bent, oval stem and mouthpiece, by Anne Julie. a) Freehand, slightly bent, oval stem and mouthpiece, saddle mouthpiece, by Sixten Ivarsson. b) Freehand, bent, oval stem and mouthpiece, by Anne Julie – 1975. 37. Freehand, bent, sitter, oval stem and mouthpiece, by Sixten Ivarsson. a) Lovat, short saddle mouthpiece. b) Small bent, short saddle mouthpiece. 39. Freehand, egg-shaped bowl, long saddle mouthpiece, by Sixten Ivarsson. 40. Small billiard, oval stem, saddle mouthpiece..
41. Medium billiard (bowl29), metal ring, push mouthpiece, by Sixten Ivarsson. Last produced in 1980.
a) Billiard, slightly bent, long saddle mouthpiece, by Sixten Ivarsson. b) Freehand, full bent, rectangular stem and mouthpiece. 43. Freehand, full bent, large ball-shaped bowl, saddle mouthpiece. a) Small billiard, full mouthpiece. 45. Pot, medium size, full mouthpiece. 46. Prince, medium size, full mouthpiece. 47. Small freehand, slightly bent, oval stem and mouthpiece, by Anne Julie – 1950s. 48. Freehand, egg-shaped bowl with rounded rim, long saddle mouthpiece, by Sixten Ivarsson. a) Dublin, slightly bent, oval stem and mouthpiece. b) Freehand, bent saddle mouthpiece. 50. Billiard, large size, oval stem and mouthpiece. 51. Small billiard, full mouthpiece. 52. Small billiard, full mouthpiece. 53. Medium size billiard, saddle mouthpiece. a) Freehand, large bent, saddle mouthpiece, by Sixten Ivarsson. b) Medium size billiard, saddle mouthpiece. a) Oval bent Dublin, oval stem, saddle mouthpiece, by Sixten Ivarsson. Designed and introduced in the late 1950’s to early 1960s. b) Freehand, slightly bent, saddle mouthpiece. 57. Small billiard, full mouthpiece. 58. Small billiard, full mouthpiece. 59. Freehand, slightly bent, saddle mouthpiece, by Sixten Ivarsson. 61. Small billiard, long 75mm full mouthpiece. b) Freehand, Plateau top, saddle mouthpiece, by Sixten Ivarsson. 63. Freehand, Plateau top, saddle mouthpiece, by Sixten Ivarsson. a) Freehand, Plateau top, saddle mouthpiece, by Sixten Ivarsson. b) Bent billiard, medium size, full mouthpiece. 67. Small oval bowl, slightly bent, full mouthpiece. b) Same as shape 67 but larger. a) Freehand, slightly bent, sitter, oval stem and mouthpiece, by Sixten Ivarsson – 1967.
b) Canted Billiard with pencil shank. 71. Freehand, rounded rim, oval stem, saddle mouthpiece, by Sixten Ivarsson. 72. Billiard, medium size, full mouthpiece. 75. Freehand, slightly bent, oval stem & mouthpiece, by Sixten Ivarsson. a) Freehand, slightly bent, saddle mouthpiece, by Sixten Ivarsson. b) Freehand, oval bowl, saddle mouthpiece, by Sixten Ivarsson. 78. Freehand, oval bowl and stem, saddle mouthpiece, by Sixten Ivarsson – 1950s. 79. Dublin, slightly bent, saddle mouthpiece, by Sixten Ivarsson. a) Small billiard, saddle mouthpiece. a) Large Pot, full mouthpiece. a) Dublin, slightly bent with oval stem. b) Large bent, saddle mouthpiece by Tom Eltang. a) Freehand, bent, saddle mouthpiece by Sixten Ivarsson – late ‘50’s to ‘60’s (info rec’d from Tom Eltang). b) Bent Billiard saddle mouthpiece. (discontinued – 2006 and replaced with shape 246). a) Freehand, slightly bent, full mouthpiece by Sixten Ivarsson. b) Large billiard, full mouthpiece. a) Large billiard, full mouthpiece. b) Large “Chimney”, full mouthpiece. c) Freehand, conical bowl, long saddle mouthpiece by Sixten Ivarsson. d) Large ball, full mouthpiece. a) Large “Chimney”, full mouthpiece. b) Billiard, medium size, very short, full mouthpiece. 90. Freehand, ball shaped, saddle mouthpiece by Sixten Ivarsson – 1951. 91. Freehand, large flat bowl, saddle mouthpiece, “Ukulele” by Sixten Ivarsson. 92. same as shape 91 but smaller by Sixten Ivarsson. a) Small Dublin, saddle mouthpiece. a) Egg-shaped bowl with oval stem. b) Freehand, straight, oval bowl and stem – 1950s. b) same as shape 86 but larger by Sixten Ivarsson. 96. Freehand, oval bowl, long saddle mouthpiece by Sixten Ivarsson. 101. “Elegence”. Push mouthpiece with a plastic connector. Small No. 48. 102. “Elegence”. Push mouthpiece with a plastic connector, bent oval bowl. 103. “Elegence”. Push mouthpiece with a plastic connector, small billiard. 104. “Elegence”, Push mouthpiece with a plastic connector. Small No. 86 by Sixten Ivarsson. 105. “Elegence”. Push mouthpiece with a plastic connector. Small No. 08 by Sixten Ivarsson. 106. “Elegence”. Push mouthpiece with a plastic connector. Small No. 79 by Sixten Ivarsson. 107. Small Billiard, full mouthpiece. 108. Freehand, sloping bowl, sadle mouthpiece by Tom Eltang. 109. Flat, ball-shaped bowl, slightly bent, full mouthpiece. 110. Freehand, oval bowl, slightly bent, saddle mouthpiece by Sixten Ivarsson. 111. Freehand, bent, saddle mouthpiece. 112. Freehand, slightly bent, short saddle mouthpiece. 113. Canadian with conical bowl. 115. Same as shape 111 with push mouthpiece..
116. Pot with oval stem. 118. Freehand, slightly bent, saddle mouthpiece by Sixten Ivarsson. 119. Freehand, oval bowl, slightly bent, saddle mouthpiece. 120. Large bent, conical bowl, full mouthpiece. 121. Large ball-shaped bowl, full mouthpiece. 122. Small Billiard, oval stem. 124. Freehand, long conical stem, short saddle mouthpiece by Sixten Ivarsson. 125. Freehand, slightly bent, saddle mouthpiece by Tom Eltang. 126. Same as shape 125 but with plateau top by Tom Eltang. 127. Freehand strongly bent, saddle mouthpiece, similar to shape 39, by Sixten Ivarsson. 128. Freehand, slightly bent, ball-shaped, long saddle mouthpiece by Tom Eltang. 129. Large, ball-shaped, strongly bent, long saddle mouthpiece by Tom Eltang. 130. Freehand, bent with push/long saddle mouthpiece. 131. Ball shaped with long stem, short saddle mouthpiece by Tom Eltang. 133. Bent, ball-shaped with saddle mouthpiece. 134. Freehand, slightly bent, with push mouthpiece by Tom Eltang. 135. Freehand, slightly bent, saddle mouthpiece by Tom Eltang. .
136. Bent, sloping bowl, saddle mouthpiece by Tom Eltang. 137. Small Dublin, sloping bowl by Tom Eltang. 140. Small freehand, slightly bent, full mouthpiece by Jess Chonowitsch. 141. Billiard, medium size, conical bowl, full mouthpiece by Jess Chonowitsch. 142. Freehand, bent, saddle mouthpiece by Jess Chonowitsch. 144. Freehand, large bent, plateau top, long saddle mouthpiece by Jess Chonowitsch. 145. Freehand, sloping bowl, long stem, short saddle mouthpiece by Jess Chonowitsch. 146. Freehand, oval stem saddle mouthpiece by Jess Chonowitsch. 147. Small pot, oval stem, short saddle mouthpiece by Jess Chonowitsch. 148. Canadian, short saddle mouthpiece by Jess Chonowitsch. 150. Special series, “Junior”, small shapes, filter only. 156. Rhodesian by Jess Chonowitsch. 157. Freehand, slightly bent, full mouthpiece by Jess Chonowitsch. 158. Freehand, oval bowl, slightly bent, saddle mouthpiece by Jess Chonowitsch. 159. Large Billiard, conical bowl by Jess Chonowitsch. 160. Large bent, conical bowl by Jess Chonowitsch. 161. Large bent Bulldog, saddle mouthpiece by Jess Chonowitsch. 162. Calabash, with brass ring by Jess Chonowitsch. 163. Freehand, “Facet”, hexagonal, with brass ring by Jess Chonowitsch. 164. Freehand, “Trio”, with brass ring by Tom Eltang. 165. Large bent, full mouthpiece. 166. Large bent, “sitter”, saddle mouthpiece by Jess Chonowitsch. 167. Freehand, “Omega”, with brass ring by Jess Chonowitsch. 168. Freehand, “Golf”, with brass ring by Jess Chonowitsch. 169. Large Billiard, conical bowl, full mouthpiece by Bang – 1986. 170. 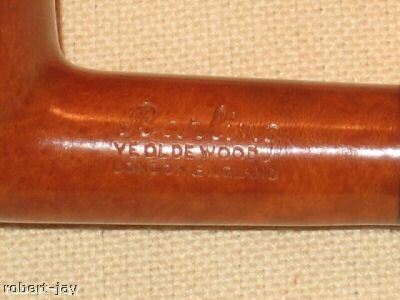 Large “Rhodesian”, with brass ring, saddle mouthpiece by Bang. 171. Freehand “Hexagon”, large bent, with brass ring by Bang. 172. Freehand “Viking”, with brass ring by Jess Chonowitsch. 173. “Rhodesian”, with brass ring, full mouthpiece by Bang. 175. Medium “Chimney”, full mouthpiece. 176. Small ball-shaped bowl, oval stem, short full mouthpiece. 177. Billiard, oval stem, short saddle mouthpiece by Tom Eltang. 178. Billiard, conical bowl, oval stem with panels, full mouthpiece by Bang. 179. Same as shape 178 but slightly bent. 180. Freehand, conical bowl, oval stem, short saddle mouthpiece by Tom Eltang. 181. Same as shape 180 but with Plateau top by Tom Eltang. 182. Same as shape 179 but larger and with filter only by Bang. 183. Large bent, oval stem with panels, saddle mouthpiece. 184. Large conical bowl, oval stem with panels, slightly bent, saddle mouthpiece. 185. Large bent, full mouthpiece. 186. Freehand, large bent, egg-shaped bowl, saddle mouthpiece. 187. Freehand, conical bowl, square stem, saddle mouthpiece. 188. 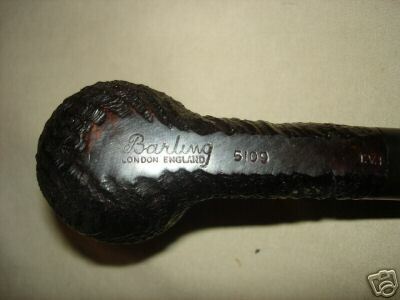 Large bent Bulldog, saddle mouthpiece by Bang. 189. Freehand, “Rhodesian bowl”, oval stem with panels, saddle mouthpiece by Bang. 190. Billiard with hexagon stem, brass ring, full mouthpiece by Tom Eltang – 1992. 191. Small Rhodesian by Tom Eltang. 192. Large Pot with short saddle mouthpiece. 193. Apple, slightly bent, short saddle mouthpiece. 194. Freehand, “Facet” with panels, brass ring, full mouthpiece. 195. Large but short Billiard, full mouthpiece. 196. Large but short Apple, full mouthpiece. 199. Featherweight, Billiard with hexagon stem and brass ring by Tom Eltang. 200. Featherweight, Freehand, small shape 86. 204. Freehand, slightly bent, square bowl and stem, saddle mouthpiece. 205. Freehand “Lotus” with brass ring. 206. Freehand “Lilje” with brass ring. 208. Sixtus, with hexagon stem and mouthpiece, brass ring, Billiard by Tom Eltang. 209. Sixtus, with hexagon stem and mouthpiece, brass ring, Apple by Tom Eltang. 210. Sixtus, with hexagon stem and mouthpiece, brass ring, Pot by Tom Eltang. 211. Sixtus, with hexagon stem and mouthpiece, brass ring, Freehand by Tom Eltang. 212. Sixtus, with hexagon stem and mouthpiece, brass ring, Freehand by Tom Eltang. 213. Sixtus, with hexagon stem and mouthpiece, brass ring, Freehand by Tom Eltang. 214. Freehand, slightly bent, square stem and mouthpiece. 215. Freehand, slightly bent, triangular stem, saddle mouthpiece by Poul Ilsted. 217. Freehand oval Horn by Jess Chonowitsch. 225. Freehand with oval shank. 227. 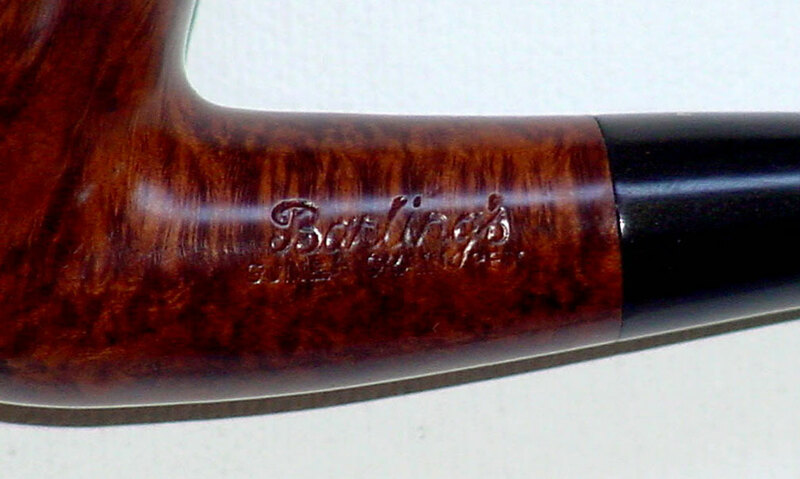 Trim bent Dublin with saddle mouthpiece by Tom Eltang. 228. Dublin by Tom Eltang. 232. Bent Billiard, sits on flat shank by Tom Eltang. 234. 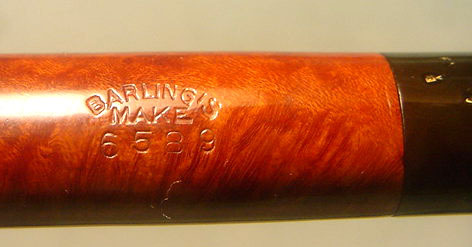 Billiard with oval shank by Poul Winslow. 241. Featherweight by Tom Eltang – 2005. 242. Featherweight by Tom Eltang – 2005. 243. Featherweight by Tom Eltang – 2005. 244. Featherweight by Tom Eltang – 2005. 245. Featherweight by Tom Eltang – 2005. 246. Slimmed-down shape 86 – 2005. 247. Spring, by Poul Winslow – 2005. 248. Summer, by Poul Winslow – 2005. 249. Fall, by Poul Winslow – 2005. 250. Winter, by Poul Winslow – 2005. 256. Statement Series by Tom Eltang. 257. Statement Series by Tom Eltang. 258. Statement Series by Tom Eltang. 259. Statement Series by Tom Eltang. 260. Statement Series by Tom Eltang. 1240 Pot, slightly bent, saddle mouthpiece by Sixteen Ivarsson. 2606. Sitter by Sixten Ivarsson. POY 1985 by Jess Chonowitsch. POY 1986 Straight Apple by Tom Eltang. POY 1987 by Tom Eltang. POY 1988 by Tom Eltang. POY 1990 by Tom Eltang. POY 1991 by Jess Chonowitsch. POY 1992 by Tom Eltang. POY 1993 by Sixten Ivarsson. POY 1995 Modified Dublin/Horn by Tom Eltang. POY 1996 Billiard w/ Saddle Stem by Tom Eltang. POY 1997 by Tom Eltang. POY 1998 by Tom Eltang. POY 1999 by Tom Eltang. POY 2000 by Tom Eltang. POY 2001 by Tom Eltang. POY 2002 Pot/Billiard by Tom Eltang. POY 2003 Billiard w/oval shank by Tom Eltang. POY 2004 Bent Apple w/oval shank by Tom Eltang. POY 2005 Straight Apple/Brandy by Tom Eltang. POY 2006 Bent elongated Peewit by Tom Eltang. This entry was posted in Pipe Related Essays and tagged Bas Stevens, Shape numbers and designers of Stanwell pipes, Shapes of Stanwell Pipes, Stanwell Pipe Shapes on September 3, 2013 by rebornpipes.